In Australia, no-one can hear you scream. Such was the premise of Wolf Creek, the innovative low budget Aussie horror that proved that it is still possible to make an original, compelling, grown up slasher movie in the 21st century. I don't usually have much truck with horror sequels, as, let's face it, they're usually rubbish. But I made the exception here. Error of judgment? 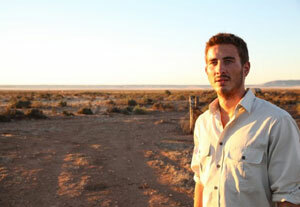 Compared to hitchhiking alone across vast tracts of outback desert, it's all relative. 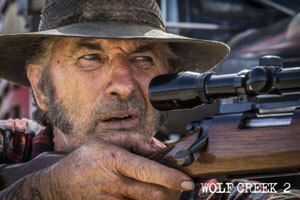 However, our previously dour, humourless, redneck serial killer Mick Taylor (John Jarratt) has morphed into an ubiquitous wise-cracking bogey-man, drawling quips Freddy-style through stained, clenched teeth, punctuated by a trademark nasal sneer of a laugh. Any subtlety has gone right out the window: where previously Mick's multiple former prey were hinted at by piled up rucksacks and discarded passports, here their bloodied, disfigured, desiccated corpses are littered about like sweet wrappers in Hostel-esque underground torture chamber. And while, according to the twisted, judgmental logic of horror, the smug, patronising youngsters of the first movie kinda deserved what they got, here our victims are a lot less vilely obnoxious – and even more helpless in the face of our anti-hero's new-found superpower that allows him to be everywhere at once, defying the laws of time and geography.